With Thanksgiving just a week away, the right combination of family, fun and food means a memorable holiday — and Coast Packing Company, the West’s largest supplier of animal fat shortenings, is offering a trio of recipes to help make that happen. This white lard bread is the perfect, versatile bread for the Thanksgiving season. Serve it warm for Thanksgiving dinner or prepare it a day or two ahead of time and make it into bread stuffing or potato filling. Prep: 2 hrs. 15 min. In a medium bowl, mix together the water and yeast. Add milk, sugar, lard, and salt and stir to combine. Add 4 cups of bread flour and mix well. Slowly add in remaining flour, enough flour to make a dough that follows the spoon around the bowl. Turn dough out onto a lightly floured surface and knead for 8 minutes, adding more flour as needed until the dough is soft and smooth to the touch. Place dough in a large greased bowl. Turn dough over in a bowl so that the top is also lightly greased. Cover with clean cloth and let rise in warm, draft-free place for 1 hour or until doubled in size. Turn dough out onto a lightly-floured board and knead for 8 minutes or until the bubbles are out of the bread. Divide dough into 2 equal pieces. Shape each half into a loaf of bread. Set loaves into greased 8×4-inch bread pans. Cover and let rise in warm, draft-free place for 45 minutes or until doubled in size. Brush loaves with egg white to give the loaves a shiny finish when baked. Slash tops with sharp knife or razor. Bake at 375 F for 45 minutes or until the bread is golden brown. Remove loaves from the sheet and let cool on a rack. Take the lamb out of the fridge, and allow it to come to room temperature (about 30 minutes). Preheat the oven to 350°F. Heat the fat of your choice in a Dutch oven, and sauté the vegetables for 5 minutes. Add the lamb, broth or stock, wine, herbs, bay leaf, and garlic, and cook, covered, in the oven for 3 1⁄2 hours. (You can also transfer to a Crock-Pot and cook for 6 hours on low.) Season with sea salt and pepper. The lamb will be very tender and juicy. 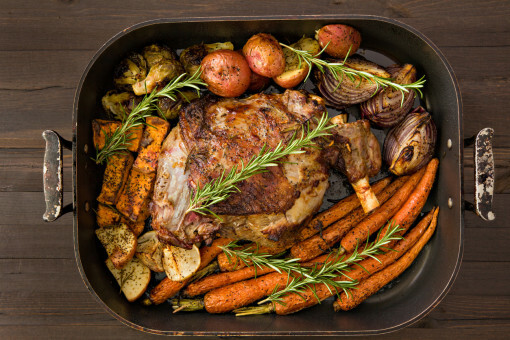 Remove the lamb and vegetables to a serving platter; conserve the drippings for the gravy. In a food processor, pulse the flower and salt. Add the butter and lard, and pulse 5 or 6 times, until they are the size of peas. Drizzle on the ice water and pulse just until the crumbs are moistened. Press the dough into a ball. Divide the dough into 2 pieces, one slightly smaller than the other. Flatten into disks, wrap in plastic and refrigerate until firm, at least 30 minutes. Add your filling of choice and bake.